Sensibio Foaming Gel is enriched with Coco Glucoside: an active ingredient that mimics the skin structure, which has lipid-restoring and moisturizing properties. Apply on wet skin. Work into a foam. Rinse well and gently dry. What are the differences between the Sensibio, Sébium and Hydrabio lines in Bioderma? The Sensibio line of products is formulated for sensitive skin types. It is safe to use on all skin types as well. Sébium is formulated for oily skin types and Hydrabio is formulated for the dry or dehydrated skin. 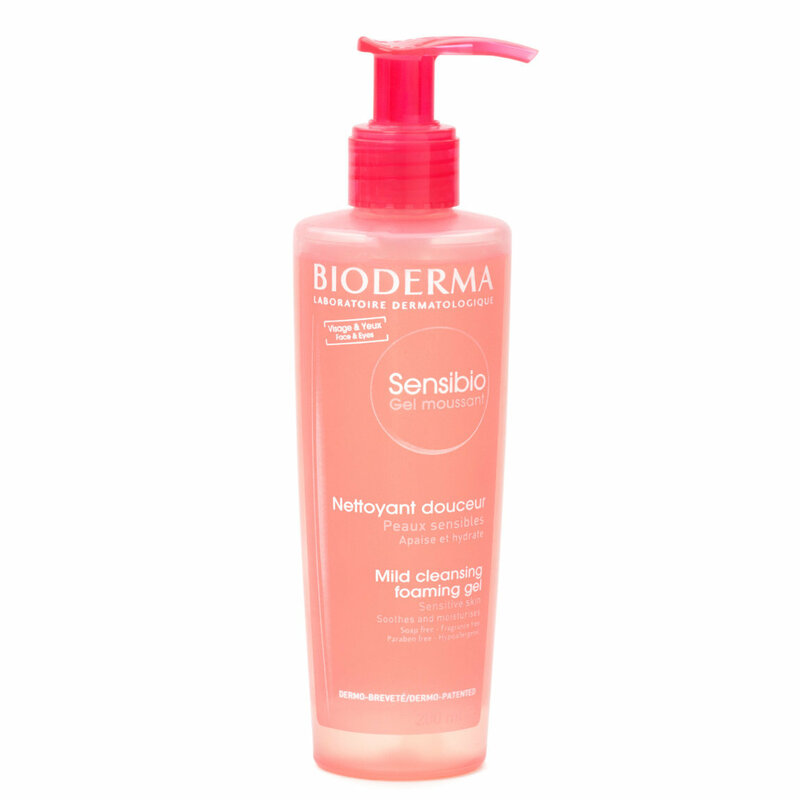 Have a question about Bioderma Sensibio Foaming Gel? I've tried probably 50 different types of cleanser, ranging in price from a few bucks to fifty dollars. I've tried cream foaming types, liquid foam types, cream types, powder types, even tried washing my face with just water. None of those have worked even half as well as this! The cleanser is a gel type that creates a very light foam when added to water. It's scent free. I use it both day and night and have never experienced drying. I have skin that is both acne prone and inner dryness. This keeps my pores clear and oil controlled while maintaining my skin strength. I'm so happy each time after I wash my face with this. I recommend this as a second cleansing step after removing your makeup, because this alone would not fully remove makeup. My only complaint would be the packaging, as it is not travel friendly. Hopefully one day Bioderma will make a squeeze bottle type AND a bigger size! Only face cleanser that works for me!! So many cleansers are plant based or contain botanicals! This one doesn't! I have tried every cleanser from every on line beauty store and this is the only one that works for me! Please don't ever stop selling it! It's fragrance free too and leaves my dehydrated skin hydrated!! Best ever!! I have used EVERY face wash out there and this is the least expensive and the greatest cleanser on the market for sensitive skin. I have combination skin so It's hard to find a cleanser that's not drying or that doesn't leave my skin with an oily finish. This product left my skin smooth and even, LOVE IT! I love this as my light morning cleanser, just to take off the serums and facial oils I used overnight. I was not a fan of the Sensibio cleansing water however this gel is completely different. Does not dry out my skin at all, good for summer and winter. My skin has been so dry and my eyebrows were always flaking. I noticed that this face wash has made my skin softer and no more flaky brows! I'm excited to try other products from bioderm. This is by far my favorite face cleanser! I am someone who suffers from somewhat erratic sensitive skin. During the summer months i am oily and somewhat combination, this can really cause me to breakout! Where as during the cold winter months i am prone to dry skin. This face wash is perfect year around for my sensitive face. I also am known to wear makeup 3 or 4 times a week and this really helps to keep my skin clear and fresh! I would recommend it to anyone who suffers from sensitivity to a lot of face washes. I have tried, what it seems like, THEM ALL. This is for sure my go to! I'm really pleased with this. I wear glasses, so I have to get really close to the mirror when I'm washing to make sure all my mascara is cleaned from around my eyes. I usually have to rinse my face clean so I can check and do several rounds of washing, even when I double cleanse, but with this cleanser being so gentle, I can monitor how clean I am in one step. I waste a lot less product this way. AMAZING for sensitive skin! Even some Lush products dry me out and make me break out, but this face wash has my back. Its light but gets the job done, and its so affordable compared to other sensitive skin products! I've been using Cerave and Neutrogena gentle foaming cleansers and this one is similar. I like that it rinses clean and makes my face feel fresh but not tight.